TORA (Temporally Ordered Routing Algorithm) is a source initiated on demand routing protocol. It was invented by Vincent Park and M. Scott Corson from university of Maryland in 1997 for wireless ad hoc network. 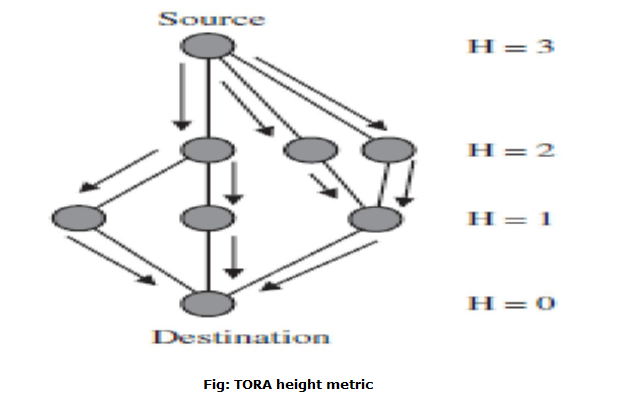 TORA is a highly adaptive, efficient, loop-free and scalable routing protocol based on link reversal algorithm. The main objective of TORA is to limit message propagation in the highly dynamic mobile computing environment. It means, it is designed to reduce communication overhead by adapting local topological changes in ad hoc network. Another main feature of TORA routing protocol is the localization of control packets to a small region (set of nodes) near the occurrence of a topological changes due to route break. Hence, each node of the network required to contain its local routing and topology information about adjacent nodes. TORA supports multiple routes to transmit data packet between source and destination nodes of mobile ad hoc network. In short, TORA exhibits multipath routing capability. Considering the data flow to be downhill, each node has a height with respect to the destination node. The analogy also makes it easy to correct routes in case of link failure or error. One of the biggest advantages of TORA is that it can operate smoothly in a highly dynamic mobile environment. It provides multiple paths for any source-destination pair. For this purpose, teach node must maintain routing information about their one-hop neighbors. Route creation: Route creation from source to destination. Route maintenance: Maintenance of the route. Route erasure: Erasing of the route when the route is no longer valid. TORA attempts to build a separate directed acyclic graph (DAG) by each node to every destination. When a route to a particular destination is required, the source node broadcasts a QUERY packet containing the address of the destination. The route query propagates via the network till it reaches either the destination or an intermediate node containing the route to the destination. Logical time of link failure. Unique ID of the node that defines the new reference level. Unique ID of the node. 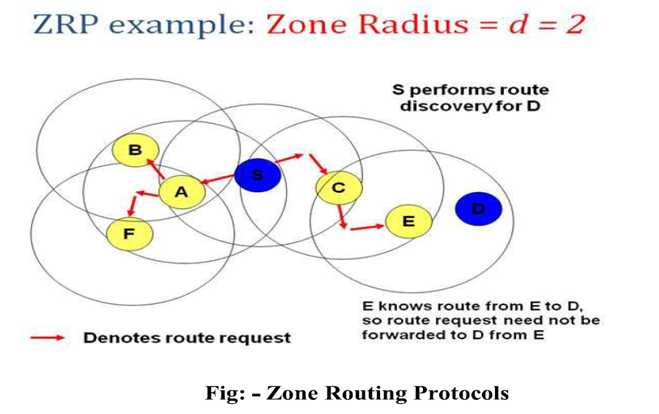 Zone routing protocol is a hybrid of reactive and proactive protocols. It combines the advantage of both reactive and proactive schemes. ZRP was invented by Zygmunt Haas of Cornell University. Zone routing protocol finds loop free routes to the destination. ZRP divides the network into zones of variable size; size of the zone is determined radius of length ?, where the ? is the number of hops or nodes to the perimeter of the zone and not the physical distance. In other words we can say that, the neighborhood of the local node is called a routing zone. Specifically, a routing zone of the node is defined as the set of nodes whose minimum distance in hops from the node is no greater than the zone radius. A node maintains routes to all the destinations proactively in the routing zone. It also maintains its zone radius, and the overlap from the neighboring routing zones. To create a routing zone, the node must identify all its neighbors first which are one hop away and can be reached directly. The Process of neighbor discovery is governed by the NDP (Neighbor Discovery Protocol), a MAC level scheme. ZRP maintains the routing zones through a proactive component called the intra-zone routing protocol (IARP) and is implemented as a modified distance vector scheme. Thus IARP is responsible for maintaining routes within the routing zone. Another protocol called the inter-zone routing protocol (IERP) which is responsible for maintaining and discovering the routes to nodes beyond the routing zone. This type of process uses a query - response mechanism on-demand basis. IERP is more efficient than standard flooding schemes. When a source node send data to a destination which is not in the routing zone, the source initiates a route query packet. The latter identified by the tuple <source node ID, request number>. This request is then broadcasted to all the nodes in the source nodes periphery. When a node receives this query, it adds its own identification number (ID) to the query. Thus the sequence of recorded nodes presents a route from the current routing zone. Otherwise, if the destination is in the current routing zone of the node, a route reply is sent back to the source along the reverse from the accumulated record. A big advantage of this scheme is that a single route request can result in multiple replies of route. The source can determine the quality of these multiple routes based on such parameter as hop count or traffic and choose the best route to be used.